By Colin Higgins | March 8, 2011. Fine Gael and Labour may be the new parties in government for the next few years, but the jury is out as to whether they can actually improve the employment situation. In such times, upskilling may be the best option and there are very few better places to do that in Dublin than in the Liberties. Some 170,000 jobs disappeared in this country last year, in one form or another, and the lack of employment is driving many people overseas. The economy shrank in the previous 12 months by 7.5% according to the Economic Social Research Institute (ESRI). The same body also claim that unemployment will hit 13.8% by the end of 2011. These figures may scare some but the Liberties are a hot-bed for upskilling opportunities. There are a number of different colleges located in the area which should be able to cater for a wide range of interests and abilities. For people who are looking to get their first step on the ladder you have the Liberties College, situated opposite St. Patrick’s Cathedral, which provides mostly Post-Leaving Certificate (PLC) courses. PLC courses are a good entry point for someone who may eventually wish to pursue a degree. Liberties College provides courses in areas from childcare to counselling as well as health care. Former student Audrey O’Gorman said Liberties College had helped her take the first step towards further education. “I completed the Health Care Assistant course in 2008. The course was an opportunity for me to see if I could study and to taste life working in a hospital. I enjoyed all the subjects and especially the work experience in the Rotunda Hospital. There is also an option for the arty people in the community in the shape of The National College of Art & Design (NCAD). 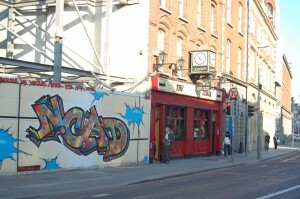 NCAD has been Ireland’s independent college for art and design. The origins of the college date from 1746 with the founding of a private drawing school in George’s lane and according to their official website their role is to promote a wider understanding of the value and meaning of research, in through and about art and design. They also believe that art and design have a crucial contribution to make to the cultural and intellectual enrichment of Ireland, and to Ireland’s capacity to create a sustainable knowledge based economy and society. NCAD is a real alternative to the other colleges available in the Liberties and its existence highlights the diversity for up-skilling available in the area. For people who wish to do a degree course you have two of DIT’s biggest campuses in Aungier Street and Kevin Street. Not having a Leaving Certificate or being over a certain age is not necessarily a barrier to re-entry into education. DIT provides a high number of places for mature students, so anybody over 23 can apply for a range of different courses. They also operate a successful community links scheme to provide advice and guidance for those who are thinking of re-entering education. They have a system in place called Recognition of Prior Learning which is a process that acknowledges, and gives value to, learning achieved prior to registering for a DIT programme or prior to seeking a DIT award. Prior learning may be a result of successful participation in a formal learning programme for which you were awarded certification. If you use your prior certificated learning towards a DIT award, the process is called: Accreditation of Prior Certificated Learning (APCL). Prior learning may also be an outcome of non-formal or informal learning achieved through work, voluntary activities or private study, for which you may not have a certificate. This programme thus offers an alternative entry point for some individuals who may otherwise not be eligible for courses in DIT. People who have achieved a PLC in from colleges similar to Liberties College may also progress onto DIT through the advanced entry system. Finally, for the musically gifted, Walton’s Musical School on Georges Street offer training for anybody wishing to pursue a career in music. Like NCAD, Walton’s Musical School provides an alternative to the usual kind of academic qualifications available in the other institutions. The college provides lessons on an almost endless selection of instruments, and their website is worth checking out as it provides some excellent in-depth information about their courses. If, like many others, you find yourself unfortunately out of work, you need not despair as there is plenty of opportunities available for you in the Liberties to learn a new skill.